2nd Annual Bentonville Tweed Ride is April 14th! 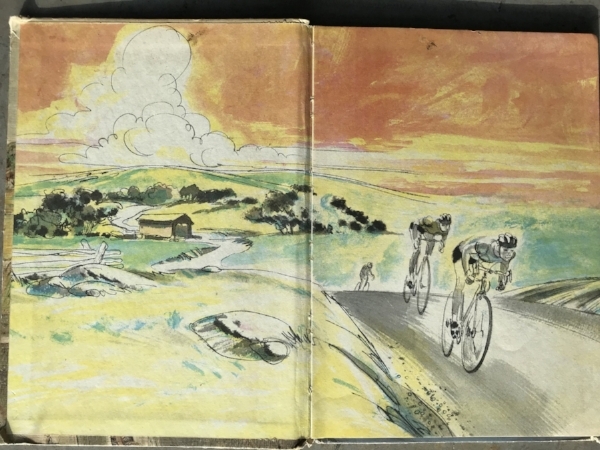 at 2 p.m.
Cycling can be inspirational so can reading. Every now and then I find something that I really like. In this instance (as is the case for most of the good things in my life) my wife is the one who introduced me to this special Item. 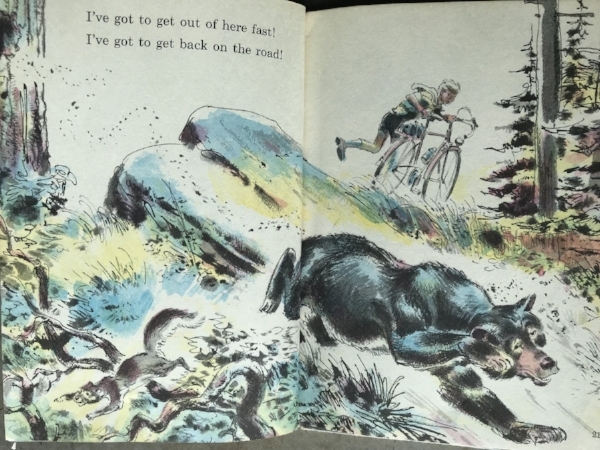 Off To the races is a children’s book that brings me the feelings of adventure, exhaustion, exuberance, community, and many others that I have come to associate with cycling. What will become of the “Kid”? Will he make it to the Rally? 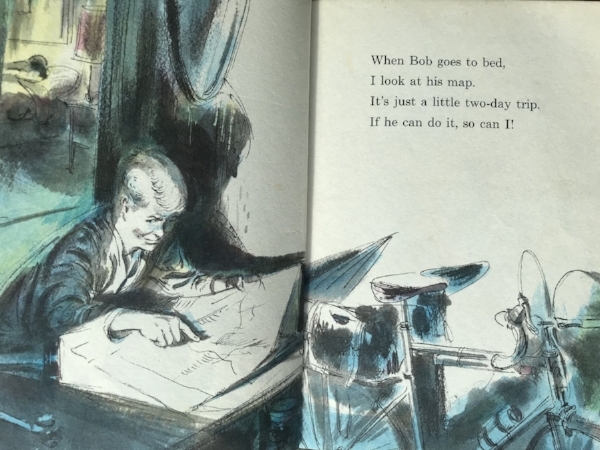 Will he catch up with Bob? ……..
You will have to check back on the blog later to find out more. Or you can buy the book online; though there are not too many options out there. We have put out some feelers to see if any local book shops can get some for us. If that happens we’ll let you know. If you like this book stay tuned for more that are coming your way soon. Our Swap meet earlier this year was a great success so we thought to have another one. We will be raffling a Burley Flatbed trailer at 1pm! Raffle tickets will also be used for drink tickets to enjoy you favorite beverage as you browse the goods. 7:35 for coffee and 8:00 SHARP for wheels rolling! This will be a short casual ride so if you're a beginner or just want a nice chill ride with friendly faces then show up at Airship coffee with a smile as we get rolling at 8 am sharp. You might want to get there a few minutes early to enjoy some of Airship’s offering. The ride will end at the shop for the swap meet so you might need to make proper arrangements if you plan to exhibit and join the ride too. If you consider yourself a coffee connoisseur and you haven't had Airship coffee yet then you're in for a treat. Jeremy will have a few cups of Bharundi ready for those who want to try it! Earlier this year we hosted a Swift Campout Summer Solstice Bike-Overnight event. We had a great time and look forward to the next one. In the meantime, we have had a few people ask for a multi day trip so why not have a beautiful fall trip with some fishes, fires, and friends! We are just want to throw the dates at you and let you know the general itinerary so you can plan accordingly. Day 1 we plan to roll out from our Fayetteville location at 10a.m. and ride to our Rogers location. We hope to roll toward the White river sometime close to 1p.m. The route will be road and gravel. For Friday night We will reserve a bunk house at Ozark Cabins and RV that Sleeps 8. Because we have to have a 2 day rental anyone who wants to come Saturday instead is welcome to use our spot and or we can use this as a back up stay for day 2 if the weather looks bad. We plan to have a fire and enjoy a quiet fall evening before the next day’s ride. If you plan on fishing be aware that AR and MO have different licenses and you are responsible for getting these if you do not already have them. Be aware that you need a trout stamp too. The fines are pretty hefty if you are caught fishing without a license by a game warden. The first Awkward Trout B ever caught. The trout are normally active in the morning and depending on the generation schedule we might have time for a little dawn fishing! We have a casual ride to Roaring River with some fishing holes along the way. There is a potential beer stop along the way so be ready for that. Only a few spots are open at the State Park but we may just camp along the river if that's what people prefer. This night is going to be camping not a cabin so be sure to prepare for that. We can fish a bit in the morning if anyone wants. Roaring River SP is only open in one zone on the day we are there so most fishing would likely be below the state park in the national forest. To get home we can either ride as a group back to Highroller or each can do their own thing in groups. If all goes well though we will head back with full bellies and fond memories! The roads are mostly gravel with some steepish sections so plan your bike and gear accordingly. If you need anything done to your bike or anything ordered in terms of gear please call the shop so we can get you all squared away before the event. Its only a month away! Comment with questions and suggestions. A week or so ago I decided to take the kids to the river. Just before we saw our first catfish of the day. If you would have told me six years ago that I would someday be into canoeing, camping, and fishing by bicycle I would not have believed you. Back then I was pretty far into the cyclocross scene. I spent all my free time planning cross courses, practicing dismounts, and waiting with bated breath for the next episode of behind the barriers to come out. I guess it makes sense really. My first truly great experiences involving cycling came to me by way of the hikenbike excursions that my scout troop did when I was a kid. We would meet as a group and then ride to some point of interest where we could run amuck for a while before riding back to the start. Eventually we worked up to the point of strapping on our back packs filled with enough for an overnight. As we set out for the camp I felt like the world was my playground. I believed I could go anywhere as far as my legs could pedal. Things move a bit more slowly now. I can’t remember the last time I “turned the pedals in anger”. I still enjoy the aspect of a physical challenge and believe me, just because you are going slowly doesn’t mean it’s easy. 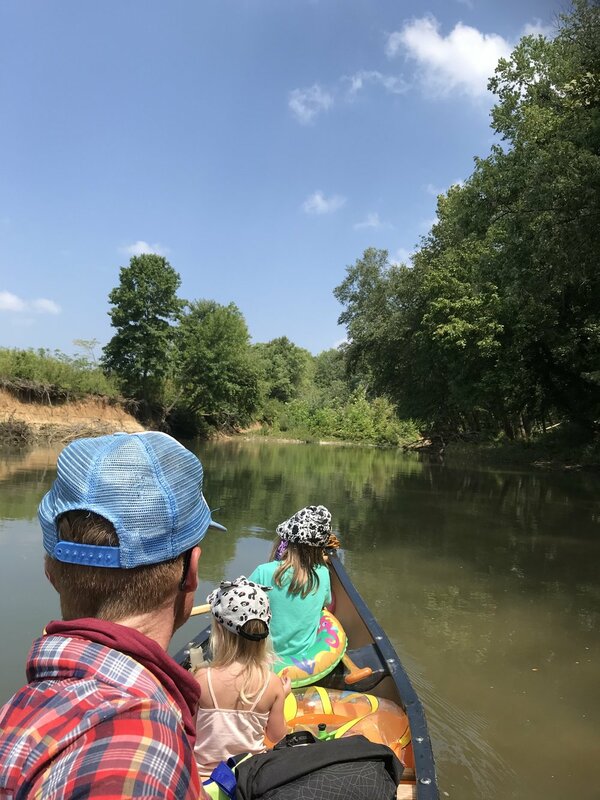 Here is a little story of one of my most recent trips that my family has come to call a pedal and paddle. A week or so ago I decided to take the kids to the river. It was just me and the kids so it took a little more time than normal to load up the boat, my bike, the trail-a-bike, and the Burley trailer. I threw together a quick lunch and did a double check that I had all the life jackets, paddles, fishing gear, water, minnow nets, and countless other things(don’t worry I still forgot plenty of stuff). We are so fortunate to live in an area that has so many recreational activities close by. Within twenty minutes I was unloading the canoe at the HWY 16 bridge over the Illinois river near Savoy. Another quick drive and we parked the car at the expected take out. As I set up the train (that’s what we call our setup - my bike pulling the trail-a-bike pulling the Burley trailer) the kids looked around, threw rocks and prepared the bags. In about ten minutes we were ready to roll. The ride back to the boat was only 4 miles on dirt roads but 2.5 of it was up hill. Let me tell you, the normal definition of uphill does not apply when you are pulling 150 pounds of humans and gear. Once we got back to the canoe I locked up the bikes and we loaded up the gear. It was noted by the youngest that quite a few ants had taken up residence in the gunnels of the canoe. The crew mutinied and refused to board until I had completely removed and double checked that there were no ants in the vessel. Snacks are key in an adventure like this. I know this and came prepared, the crew was content to eat granola bars on the bank while I worked. The actual float was a blast. We floated about 4 miles and stopped many times for swimming, fishing, lunch, etc. My oldest is a very comfortable in the boat and she is getting the hang of actually paddling in some type of constructive manner. The youngest is typically on net duty trying to scoop up unsuspecting minnows. The scenery on this part of the river is highlighted by some really beautiful sycamore trees, long low sandstone bluffs, and a few abandoned vintage Volkswagon vans. A big blue heron accompanied us for the better part of the trip and we even managed to catch a few fish along the way. Surprisingly we did not encounter a single snake and saw very few turtles. When we arrived at the take out the kids played while I schlepped all the gear and canoe up to the car again. Once we were loaded we drove back to Fayetteville stopping to pick up the bikes along the way. Quick outings like this (okay, it still took the better part of 6 hours) are what I love to do these days and with a little planning they are pretty easy to execute as well.